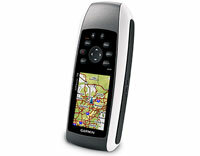 Garmin GPSMAP 78 (010-00864-00) €0.00 - buy online at mysatnav.ie - Ireland's leading GPS & Sat Nav store. Adding more maps is easy with Garmin's wide array of detailed marine, topographic and road maps, available on microSD card. Conveniently plug in BlueChart g2 preloaded cards for a great day on the water or City Navigator NT map data for turn-by-turn routing by road (see maps tab for compatible maps). The card slot is located inside the waterproof battery compartment, so you don't have to worry about getting it wet. GPSMAP 78 also supports BirdsEye Satellite Imagery (subscription required), that lets you download satellite images to your device and integrate them with your maps. In addition, the 78s is compatible with Custom Maps, free Garmin software that transforms your own paper and electronic maps into downloadable maps for your GPS handheld device.